Photo Credit: BottleRock Napa Valley. 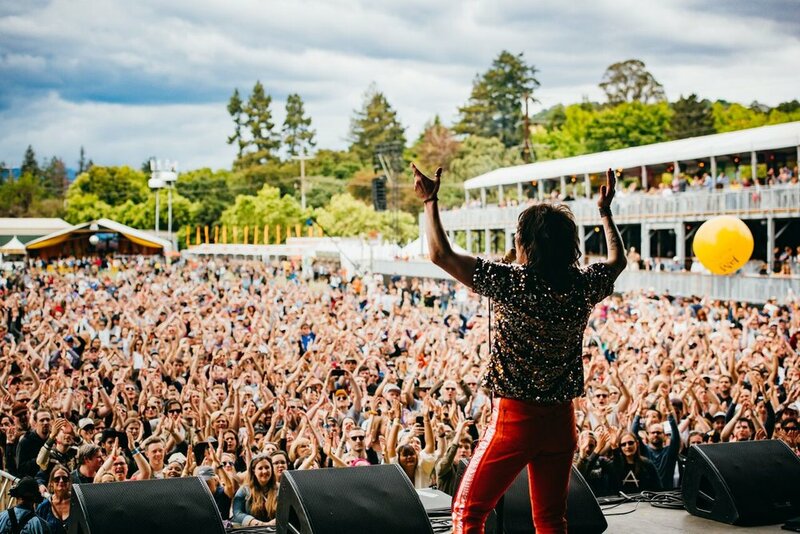 For the 6th consecutive year, BottleRock NapaValley took place over Memorial Day Weekend at the Napa Valley Expo. The festival continues to soar as one of the best while bringing top foods and beverages along with creativity to the forefront. BottleRock has quickly been deemed as a foodie festival! With world renowned chefs such as Morimoto and even bringing merging cooking demo’s with your favorite celebrities and musicians, there is LITERALLY something for everyone at this three day festival! In true fashion BottleRock did not disappoint, it seemingly never does. While many festival lovers will proudly say this is by far the best of the best. In terms of functionality you’re able to move from one stage to another in mere minutes with little to no hold-ups, which is not likely at many other festivals. The festival offers and lot of options and always narrows down the amount of time waiting in lines! Instagrammable moments are also a thing associated with this festival as it paints the perfect backdrop. BottleRock Attendees Saw ALL Sides of Shakey Graves With His Performance! Photo Credit: BottleRock Napa Valley. Day 1 kicked off on the chilly side. As clouds hovered over and brought in the San Fransisco fog many thought the day would end with a heavy downpour. This did not stop everyone from rolling in. The hour long commute quickly went to 3 as attendees poured in with full anticipation of what would occur! True music lovers will also agree, the best time to get to a festival is early on to discover all of the ‘lesser-known’ artists and also see the variety of styles at the fest. Day 1 broguth Welshy Arms to a 3PM set! The gospel, blues-inspired band, who recently dropped their debut Album No Place Like Home, surprised attendees. Their most known single, “Down To The River” and “Sanctuary” truly put them on the map. Baeble describes the single as “combining a gospel choir with the most scorching hook, ‘Sanctuary’ is instantly the most soulful anthems of the decade,” and we could not agree more. “We always try to keep a gritty soul edge with everything we do,” states Getz.”the vocals stick out, and the music is deep and raw. We take pride in producing all of the recordings ourselves. It’s important to the sound.” No wonder they have a whooping 15 million streams on Spotify! Many of the lesser known bands seemed to have one thing in common, a blue-grass down south feel with a country undertone, which was a nice touch. Since its inception we have seen the lineup change drastically. With its first year being heavily influenced by country with headliners like Alabama Shakes to slowly entering a more pop and rock phase with Gwen Stefani and Florence and the Machine. This year, all genres are covered however there is a more notable country roots presence. Shakey Graves took over the Midway Stage about mid-day! The Austin, Texas native poured his soul out to the crowd. One thing that is pretty spectacular with Shakey Graves, listeners can see the evolution of him in his personal life through his music. The Chainsmokers was an interesting addition to the lineup. Known for singles “Rozes” amongst others, the duo brings high energy to a sleepy city. Initially looking at the set you would think Vegas is making it’s debut at the Napa festival. However, quite the surprise their set was a bit lackluster. Overpowering bass, which is normally needed to drive excitement due to the simplicity of the lyrics, was not in tact during this performance. That could have easily been because of Muse performing at similar times. Muse closed out the night with a psychedelic performance. Although frontman Matt Bellamy kept referring to the festival as being held in San Francisco, BottleRockers didn’t completely fault him for it. At one point Bellamy rocked black shades with the lyrics to “Madness” across the front as he sang. Towards the end of the almost 2-hour set confetti and streamer cannons went off to commemorate the end to a perfect first day! An Incredible End to Day 1 of BottleRock! Photo Credit: BottleRock Napa Valley. Staying true to curfew and for respect of Napa Valley residents the festival closes each night at 10PM to obey the city ordinance laws, however that does not mean the full day’s activities are lackluster! Click HERE for day 2 coverage, HERE for day 3, and HERE for our top eats!